A hectic week in work finished with an early start yesterday so I took the opportunity of a Sunday lie-in and a leisurely breakfast. I plan on a trip to Gilroy for more Godwits. Numbers are up to 180-odd but colour rings are thin on the ground. I'm about to start packing up the kit when the mobile goes. 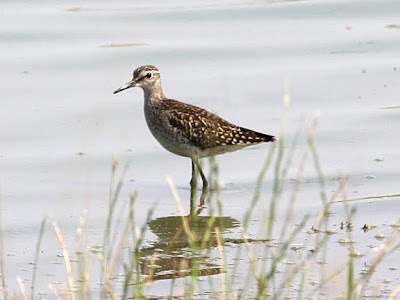 There's a Wood Sandpiper at Gilroy! That speeds along the process of assembling the cameras and scope! The bike is out and I'm soon going hell-for-leather to the reserve. The Wood Sandpiper is still there (relief!) and it is quite close in (bonus!) so the camera comes out and I fire off a few frames. Seeing this bird makes it a hat-trick of Sandpipers for me at Gilroy this passage season. I've seen Common and Green Sandpipers here over the last few weeks, but I'd sort of expect that with the effort I've put in. Wood Sandpipers are not so regular, but there have been a few seen on the Estuary recently. It is a lovely summer day so I decide to hang around for a while. So, what's about? 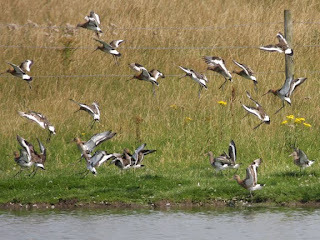 There are plenty of Godwits (108 when I arrive) even though some were put off by a Sparrowhawk. 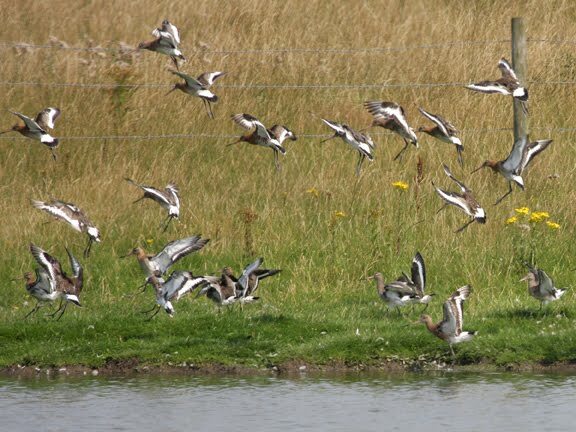 She comes back and they all go up again, but the Wood Sand doesn't bat an eyelid! They settle again and I go through them with the scope. No rings but there is a lone Knot amongst them. Many of them are sitting on the floor. This seems a little unusual and is not something I've seen here before. Up they go again! I can't see it but I presume the Sprawk is back. The gulls have gone up to the the Wood Sand remains unflappable. News of the Sandpiper must have got out as there is a steady flow of birdwatchers who arrive, see it and leave again. Fair enough I suppose, there is alot of stuff about on the Estuary today, but I'm a real fan of hanging around to see how a site changes over a few hours. There is always something to see. I notice a couple of big Brown Hawker dragonflies patrolling the pond and as I scan the Godwits I see a Common Blue butterfly fluttering along their lines. A couple do seem to notice and look at it before it disappears over the meadow. 2 Swifts swoop over the water, I'm concious that they'll be off to Africa soon and I probably wont see them again until next May so I watch them for as long as possible through the binoculars. More waders are dropping in, the tide is flooding the mudflats stopping them feeding. 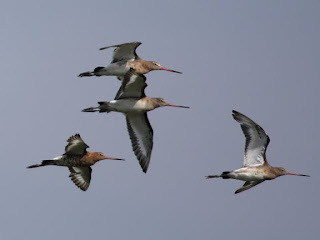 Another 60 Godwits speed in and I check them for rings (0). As I'm doing this the distincitve "CHOO-CHOO" call of a Greenshank rings out. It's circling and soon it drops into the pool at the back edge. It isn't a fan of the Wood Sand and chases it down the bank, the first time the Sandpiper has appeared upset all day! My Dad arrives with some telephoto kit to try and get the Wood Sand, but it is a little distant. We spend a rather enjoyable hour watching and recording Swallows and House Martins taking insects off the surface of the water. He get some shots of the Sandpiper and the Greenshank too. Every now and then a couple of Godwits fly in but things remain quiet. It is just great to be out in the sun watching as the birds go about their business. Feeding, preening, roosting etc.